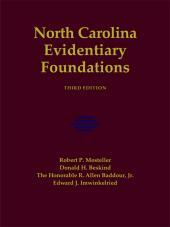 Learn how to address and overcome evidentiary problems in North Carolina courtrooms. Learn how to address and overcome evidentiary problems in North Carolina courtrooms. 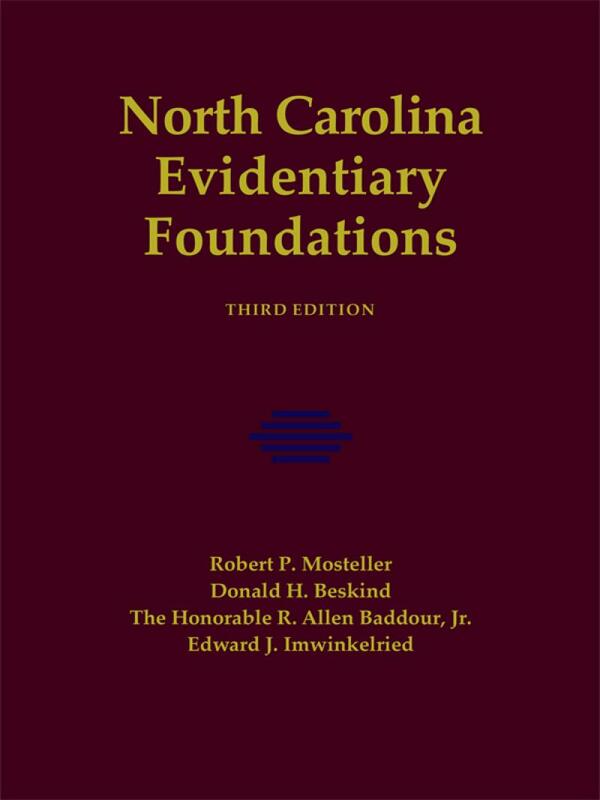 North Carolina Evidentiary Foundations brings North Carolina evidence law to life, showing you how to frame foundational questions to gain admission or exclusion of evidence. 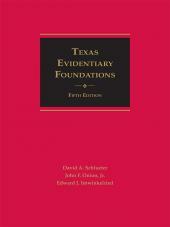 The book includes specific lines of questioning, demonstrating courtroom-proven trial techniques that apply North Carolina evidence law. Donald H. Beskind is Professor of the Practice of Law at Duke University School of Law where he directs and teaches in its Trial Practice program and teaches Evidence and Torts. After practicing law in Colorado for several years, Mr. Beskind was, in succession at Duke Law School, a John S. Bradway Fellow, an assistant professor, and an associate professor and the director of the Clinical Legal Studies Program. Mr. Beskind returned to full time private practice from 1980 to 2010 specializing in plaintiff's tort litigation, and was been listed among the "Best Lawyers in America" in various publications since 1993. He continues to practice on a limited basis. 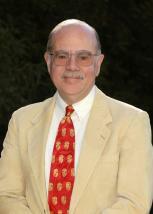 Mr. Beskind was a long time program director for the National Institute of Trial Advocacy. He is co-author of BMI v. Minicom, Inc.; State v. Burns; Problems in Trial Advocacy; Effective Use of Courtroom Technology: A Lawyer's Guide to Pretrial and Trial; Developing Deposition Skills and North Carolina Evidentiary Foundations. He has published articles and spoken on evidentiary and trial skills topics and runs trial training programs in the U.S. and Great Britain. The Honorable Catherine C. Eagles has been Superior Court Judge for the Eighteenth Judicial District of the State of North Carolina since 1993 and Senior Resident Superior Court Judge since 2006. She practiced law with Smith Moore in Greensboro (1984-1993) and served as law clerk to the Hon. J. Smith Henley of the United States Court of Appeals for the Eighth Circuit (1982-1984). She has served on the Board of Governors of the North Carolina Bar Association and is presently on the Board of Directors of the University of North Carolina School of Government Foundation. Judge Eagles is the Education Chair for the Conference of Superior Court Judges and is the primary instructor at the School for new Superior Court Judges. She graduated Phi Beta Kappa from Rhodes College in 1979 and with honor from the National Law Center at the George Washington University in 1982, where she was on the Law Review. 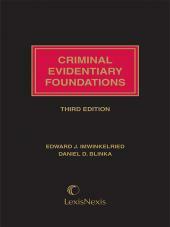 Edward J. Imwinkelried is the Edward L. Barrett, Jr. Professor of Law Emeritus at UC Davis School of Law. A nationally recognized expert on subjects such as DNA typing, forensic psychiatry, and laser techniques for fingerprint detection, Professor Imwinkelried is the author of more than 200 books and other publications. 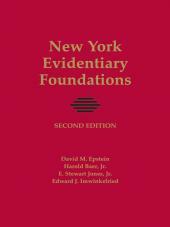 He is frequently called upon for advice on privileges and the admissibility of evidence of other crimes, and his treatise Scientific Evidence is considered authoritative. Professor Imwinkelried served as an army lawyer in the XXIV Corps and 196th Light Infantry Brigade in Vietnam in 1971-1972. He went on to become a lecturer on evidence, criminal procedure, crimes and trial advocacy in the Criminal Law Division of the Judge Advocate General's School in Virginia, then a Professor of Law at the University of San Diego and Washington University before coming to UC Davis in 1985. He has also taught as a Visiting Professor at the Ohio State University, the University of Illinois, University of Houston, and University College Dublin. Robert P. Mosteller is the Harry R. Chadwick, Sr. Professor of Law at Duke University. A noted educator, author and lecturer on Evidence and Criminal Law, Professor Mosteller has served as Law Clerk to the Honorable J. Braxton Craven Jr., as Chief of Trial Division in the DC Public Defender Service (1982 - 1983), and as reporter for the Criminal Justice Committee of the Commission for the Future of Justice and the Courts in North Carolina (1995 - 1996). He currently serves as Secretary for the Evidence Section of the AALS and is a member of the Board of Directors of the North Carolina Legal Assistance Foundation. Professor Mosteller holds a BA from the University of North Carolina - Chapel Hill, a JD from Yale Law School, and a Masters in Public Policy from Harvard University.